Nature’s Bounty knows menopause is a time of change for women. That is why they have created a natural supplement to support the physical changes women may experience during this time of life. However, this supplement does not stop there. Black Cohosh also helps to relieve hot flashes and night sweats, and helps with mild mood changes. Analyzing these claims alongside customer reviews, it seems this product has an above average success rate. Due to this fact, Black Cohosh definitely deserves a closer look. 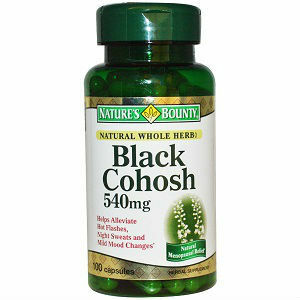 Users of Black Cohosh are directed to take 1 tablet every day. It is recommended that these tablets be taken with a meal. However, for those who do not wish to take a pill, tablets can be opened and prepared as a tea. Black Cohosh can be purchased on Walgreen’s Website for $11.49. With each purchase, customers will receive 100 capsules. Based upon dosage, this is approximately a three month supply. It should also be noted that customers can receive a buy one get one free discount when purchasing this product. After reviewing this particular product, it has been concluded that no guarantee accompanies Black Cohosh. This should be a concern to those considering Nature’s Bounty’s product. A company should always back their product with a guarantee, thus creating a safety net for all customers. Based upon the information reviewed, it seems that Nature’s Bounty provides a reasonably priced product that can help with some of the problems associated with menopause. Nonetheless, the pros of this product cannot be examined without addressing the cons. The first con concerns the benefits. Although Black Cohosh does promote physical health and relieves a few menopause symptoms, there are many other symptoms that will be left unaddressed by this supplement. Women in menopause experience a vast array of symptoms. Therefore, since Black Cohosh only addresses three, other medicines will have to be consumed, increasing the daily consumption of medication. The second con concerns the lack of a guarantee. Guarantees show a company’s confidence in their product and also provide a security element for each customer. Without any form of a guarantee, customers may be buying into an unsuccessful product with no hope of a return on their investment. Jackie Horowitz	reviewed Nature's Bounty Black Cohosh	on April 16th	 and gave it a rating of 2.